This is a series of high resolution digital panoramic photographs made with a specially modified Dicomed Digital Scanning Back and the BetterLight Scanning Back used with a traditional 4x5 View Camera. 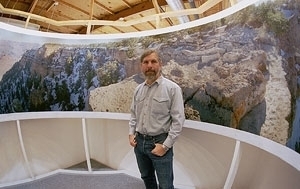 Beginning in November 1995, Stephen Johnson has been making huge digital panoramic photographs. Originally made with an adapted Dicomed Digital Insert for 4x5 cameras, this prototype device yeilded photographs up 6,000 x 65,000 pixels (1.2 gigabytes), in color, black and white or infrared. The Panoramic adaptor was designed by Howard Barney (BayHouse) with software by Michael Collette (BetterLight). Recent panos made with Better Light pano adaptor. The BetterLight WideView panoramic adaptor has been used since 1999. Photograph Copyright ©1995 by Stephen Johnson. All Rights Reserved worldwide. The first digital 360° panorama was photographed starting at 10:58 am this morning (11/5/95) from the top of Fort Point under San Francisco's Golden Gate Bridge (in the Golden Gate National Recreation Area). Stephen Johnson and Michael Collette took a 370 degree digital photograph with a specially modifed Dicomed Digital Camera on a rotating rig designed by Howard Barney (Bayhouse). Stephen Johnson setting up first digital 360° panoramic photograph. Hanging Panorama of the Golden Gate. The Digital Pond, San Francisco. February 2, 1996. Mary Ford in the Hanging Panorama of the Golden Gate. The Digital Pond, San Francisco. February 2, 1996. The first prints were very distorted by flattening out a surround space onto a print. We couldn’t wait to hang one into a circle and stand inside. We got the chance in February 1996 with print house The Digital Pond in San Francisco (thanks Pete Hogg) who laminated our 25 foot long print and helped us build a temporary hanging display. We could then duck in and stand inside the surround image. I said at the time, that standing inside my photograph of the Golden Gate Bridge was “the most immersive photographic experience I had even seen.” The term was later picked up by the press and used generically for surround imaging. A laminated print was displayed in a very clever spiral pipe design by Robin Myers in the Adobe Booth at MacWorld New York in July 1998. A permanent panoramic room built by Robin Myers was constructed at Stephen Johnson Photography Gallery and Studios where it remained on display until 2004. Steve in the Panoramic room in his first gallery. 1999. In 1995 Apple contracted with me to work on their QTVR project. Those of us working on the project were tasked with making a series of film-based pano sets which would then be scanned and assembled into the QTVR format. With the QuickTime Authoring Studio we tested the assembly of the photos into surround images, and built multi-node interactive files. Soon I was using the BetterLight Scanning Camera Panoramics, this skipping the scanning process entirely.